Also the Smurfs were present in Shanghai at the 1st China International Import Expo. 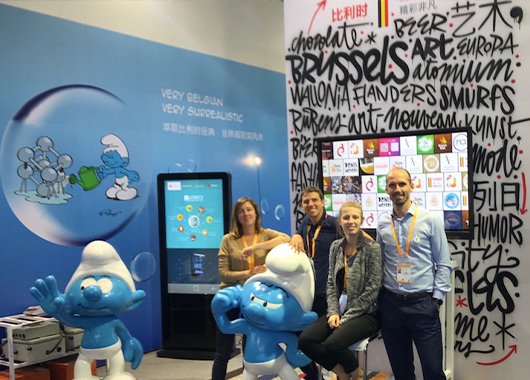 In addition to animating the Belgian Night at M1NT on 3 November and the opening of the new Gracina Life showroom on 4 November, the Smurfs were also present at The Anchor Group trade in services booth at CIIE. The Smurfs have been popular in China since the eighties and are growing again in popularity amongst the smallest. IMPS, the Belgian company owning the licenses to the work of Peyo and developing the Smurfs worldwide will be opening an attraction park near Shanghai in 2020. The Anchor Group assisted IMPS during CIIE to find new partners in China to extend its merchandising manufacturing and distribution. A number of concrete contacts have been made and agreements are in the making.